At a local friend’s urging, I decided to enter some of my fiber arts work into the county fair. I figured that since I’ve only been knitting since February 2010, surely I would rank mediocre at best. I like to try some unusual and challenging pieces, but I still feel like such a beginner! I figured I didn’t have much to lose since the entry fee is only $5 though, so I got to work on some special projects. My first project for the fair was a pair of socks I’ve been wanting to knit for myself for quite some time. I’d seen someone else win a second place ribbon in one of my Ravelry groups with some knee-high socks, so I figured that knee-high socks were an impressive enough sort of project to enter into a fair. I ordered the yarn and made a few modifications to the pattern. The pattern was beautiful as written, but featured many floats over 5 stitches which is not structurally sound or traditional knitting. These socks also had a heel type I’d never tried before that is unique to traditional Norwegian stockings. It was great fun to learn the new heel and to do so much stranded colorwork. That’s my favorite kind of knitting to do. It takes just the right amount of attention to detail and works up into a nice, thick fabric. I like my knits to be cozy. The hardest part of these socks was actually blocking them. 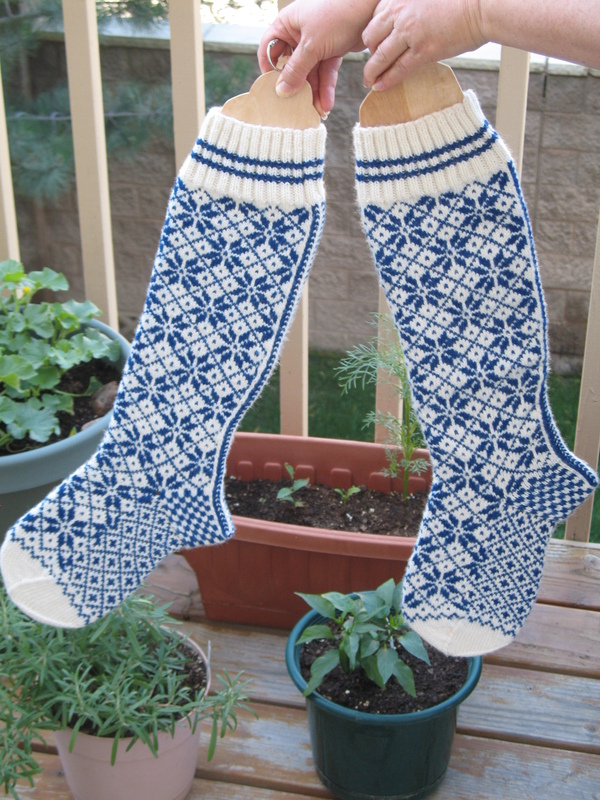 I’d never blocked socks before, but I figured they needed to be done up nicely. I couldn’t find large enough sock blockers anywhere, so I ended up having to make them myself. Unfortunately, I’m not doing well enough physically since the most recent accident to be using my power tools. I broke a half dozen blades and failed at cutting on the lines I’d drawn on the plywood. The sock blockers aren’t great, but they’re enough to get the job done. Any puckering from the stranding blocked right out of the socks. 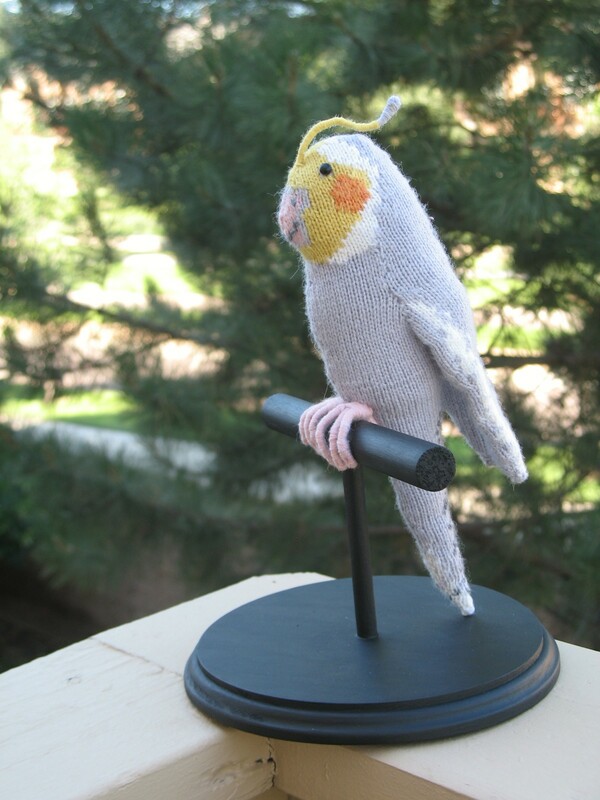 Then, because I was trying to work on the project anyhow to publish the pattern, I decided the bird I was knitting could be entered in the knit toy category of the fiber arts department. I’m currently working on getting the pattern typed up and materials to a test knitter. The pattern will be available for purchase and download by the end of the year. The entire bird is knit from Knit Picks Palette yarn on size 0 needles. It’s stuffed with wool as well, and has wool wrapped wire for the feet and crown feather. The eyes are 1/4″ rounded-top, shank-style buttons. I made the stand out of craft wood from Michaels Arts and Crafts and painted it out matte black so it wouldn’t fight with the cockatiel for the eye. 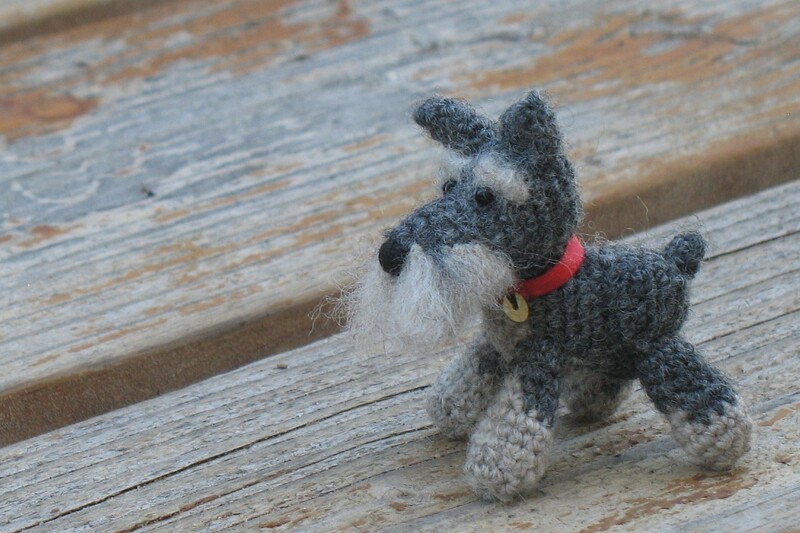 Finally, right after the most recent accident, a Ravelry friend of mine gifted me a pattern for a crocheted schnauzer as a feel better and know you’re loved sort of thing. I figured I’d better crochet a little dog and post pictures to show my appreciation. I didn’t really want a great big toy dog cluttering up the place though, so I unraveled some wool yarn and crocheted with only one ply of yarn on a size 7 steel crochet hook. This made an itty bitty toy dog and almost everything is better in miniature! I also rewrote the legs in the pattern, did the face embroidery differently, and needle felted in the beard. I made him a collar out of the finest red ribbon I had and stitched on a sequin to be his dog tag. His eyes are two black beads that were in with the rest of my seed beads but mysteriously a size larger than the rest. Working on such a small scale with such fragile single ply wool was a pain, but the end result was totally worth it. He came out so well I decided I may as well enter him too. After all, you can enter up to 10 items for the $5 entry fee. You only have to pay extra if you enter more than 10 different items in 10 different classes. You also only get $4 back if you win a first place ribbon though, and I wanted to up my chances of making back my $5. When you’re really broke, that $5 matters a lot! When I finally got to go to the fair after judging on Saturday, I was greeted pretty quickly with my knit socks. They won first place in the knitted accessory category (socks, hats, gloves and such) and won the Adult Fiber Arts Department Reserve Champion ribbon. I had to ask what that meant exactly, and it’s second place out of all adult fiber arts entries: knitting, crocheting, spinning, weaving, tatting, felting, and rug hooking. How exciting! Then I found my knit bird and crocheted dog in the glass display case. They each also had a first place ribbon for their category on them, knit toys and crochet toys respectively! I was thrilled! We looked around at all the other entries for a while, and we couldn’t find the Adult Fiber Arts Department Champion. I really wanted to see what was nicer than my socks. We asked and were told that not all the ribbons were on the items yet. The woman helping us went to check the record book and when she came back, she was carrying the champion ribbon to hang on my crocheted dog! I couldn’t believe it! I won every single award my items were eligible for, three first places, the department champion, and the reserve champion! I’m so excited. I can’t wait to pick my items up, show off the ribbons and projects at show-and-tell at the Front Range Fiber Artisans annual picnic, and get my winners (the socks and dog only) to the state fair. I’d send the bird too, but the state fair combines knit and crochet toys into one class, so I can only enter one of them. Fingers crossed for more success at the state level. It’s much more competitive and you don’t even get your items displayed unless you win.